I don't usually buy the instant noodles that come in disposable packaging; I think it is just a waste from an environmental standpoint. But once in awhile I'll buy one if it looks interesting enough. In this case, my curiosity was piqued by the fact that these are made by Samyang foods, one of my favorite Korean noodle brands. 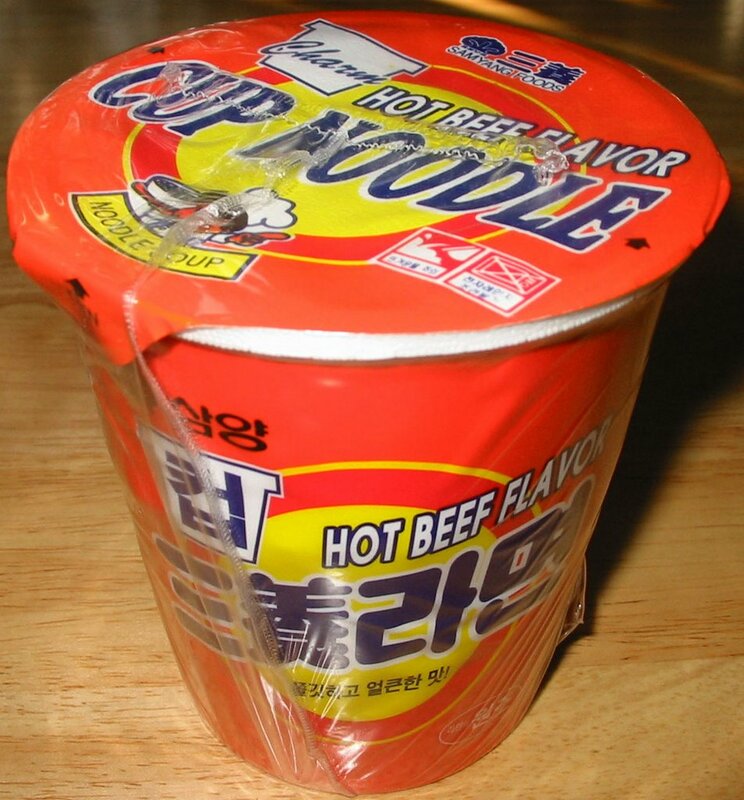 Unlike most American noodle cups, these contain a flavor sachet under the lid that you need to open up and put on the noodles. I'm guessing that this is so they can package it with a different flavor sachet and instantly change flavors. The noodles inside bear little resemblance to those found in the "brick" style instant noodles made by Samyang Foods. 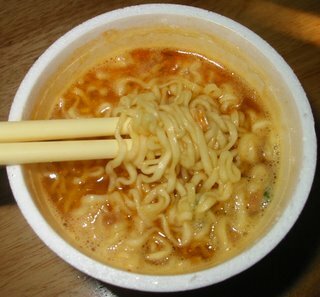 These are much thinner and less flavorful, much like the noodles found in Nissin Cup Noodle or Maruchan Instant Lunch. Quite a disappointment because I was hoping that they could replicate their tasty noodles in this cup form. The flavor definitely reminded me of Samyang's other offerings. Unlike those, this had a bunch of chunks of Textured Vegetable Protein (TVP). I don't really like TVP because it just tastes unnatural. But I guess they decided to include it just to be more "beefy". While the flavor of the broth was pretty good, the noodles themselves and the inclusion of TVP ruined this experience for me. From now on, I'm going to stick to Samyang in "brick" form. 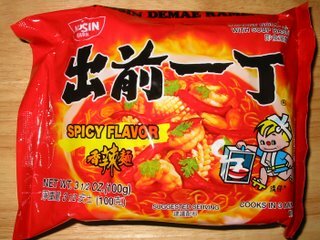 The Nissin Demae Spicy Flavor is one that I remember fondly from my childhood when my family would purchase entire cases of these. I also remember the fiery bliss of having numb lips and tongue after downing one of these. The packaging has changed a little bit over the years, but the message remains the same: these things are SPICY. I especially like that they don't try to mask the intent of these noodles as "Spicy Beef Flavor" or "Kimchi Flavor" or anything like that. 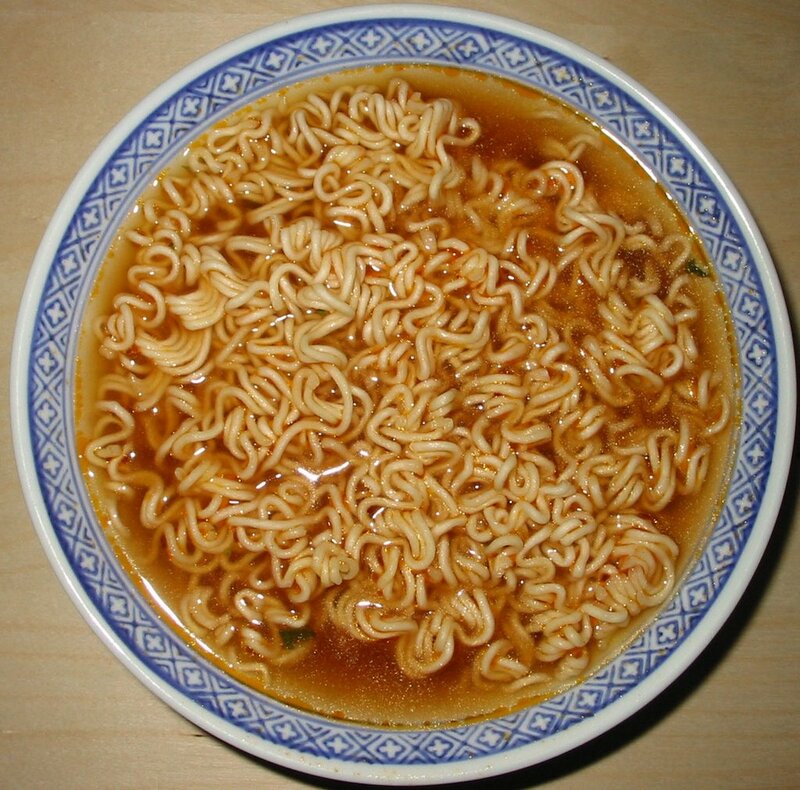 I am very familiar with Nissin Demae's noodles and they represent the default noodles that I think of when I think of instant ramen. I was very confused when I made these noodles. They looked nothing like I remembered, which was a sea of red, almost as intense as seen on the packaging. The taste was even more disappointing! It really wasn't spicy at all, and tasted mostly of just sesame oil. I have no idea what went wrong, but I'm hoping that I just received a fluke package or something. I will have to pick up another pack of these sometime and find out for sure. As usual, I don't really know what the name of these instant noodles mean, but that didn't stop me from trying them. 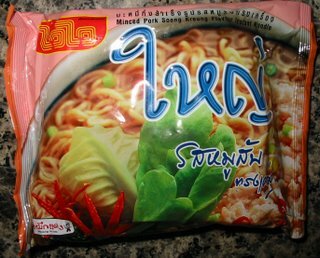 These are imported from Thailand, so I'm guessing that Minced Pork Soeng Kreung is a Thai dish. 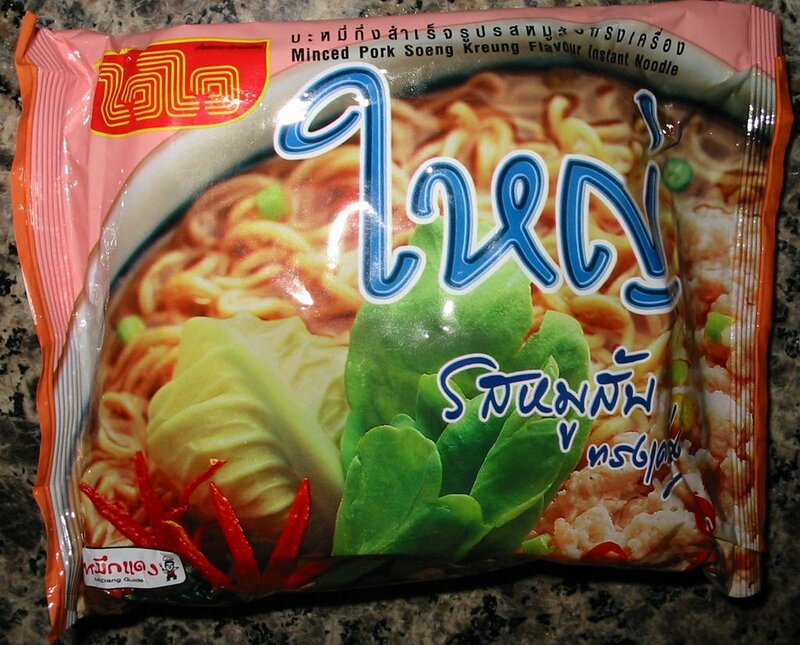 These are on the smallish side for instant noodles, as tend to be the case with imports from Thailand. 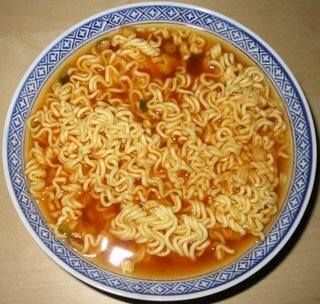 Thai noodles also tend to be more exotic flavors, which is a sharp contrast with imports other countries, especially Korea. The noodles themselves were much thinner than the typical instant noodles. They tasted quite good and reminded me of mifun noodles, although these were made with wheat instead of rice. 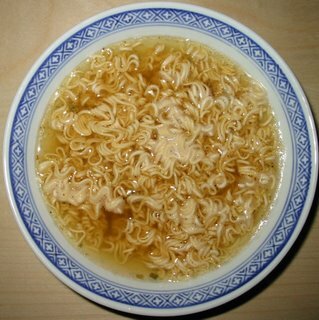 The broth flavoring consists mostly of onion and spicy oil. It was quite good, although I thought it was a little bit too oily. I was a little surprised that these turned out to be spicy, but not disappointed because I rather like spicy instant noodles. It's hard not to notice these noodles on the shelf with their flaming red packaging. 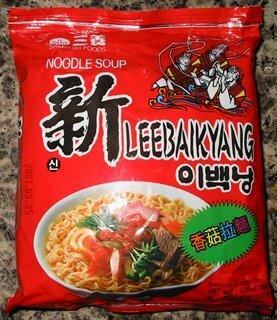 Made by Samyang Foods, the Leebaikyang noodles are imported from Korea and are graced by a trio of jolly musicians on the package. 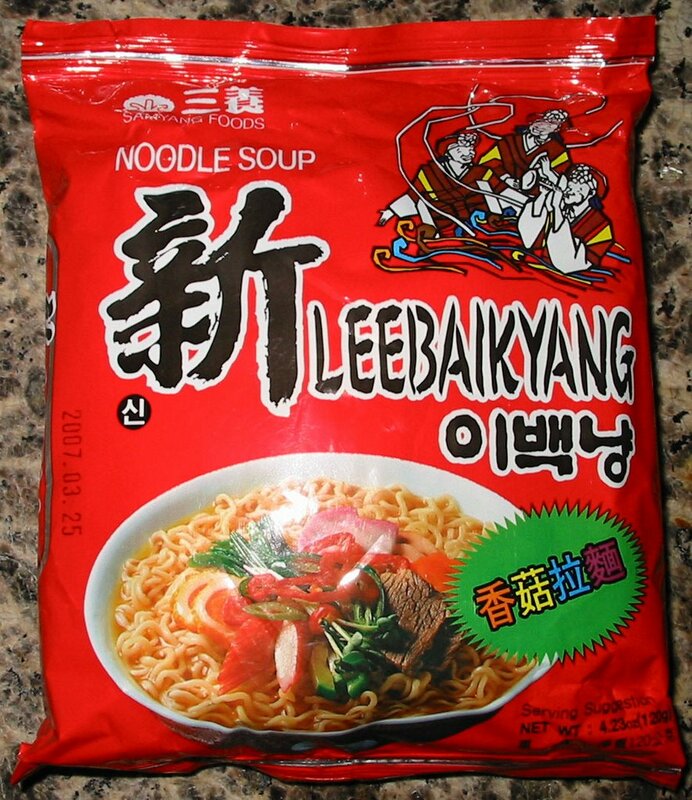 I have no idea what Leebaikyang means, but I have had good success with Samyang Foods in the past, so I decided to try these noodles. Judging by the packaging and where these noodles come from, I would guess that they are probably spicy hot with not much other flavor. Like all their other products, Samyang noodles are very chewy and need to be cooked a little longer than the average ramen. However, I feel that they also tend to be tastier with a little more flavor as well. They definitely have more substance and will fill you up better. 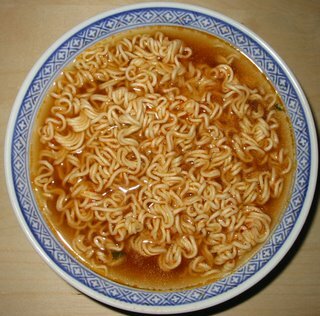 As I expected, these noodles turned out to be just like every other one of Samyang Food's spicy instant noodles. 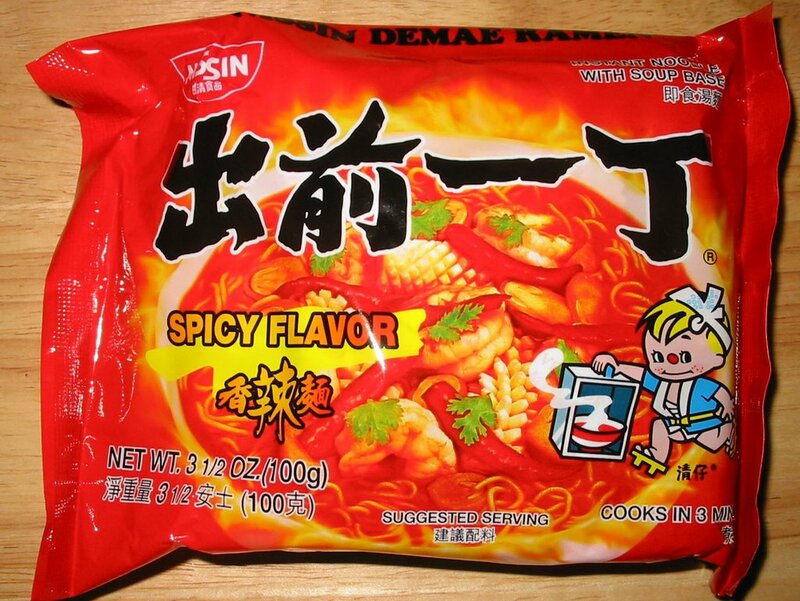 The spiciness is very strong and has a tangy chili powder flavor. There's a nice amount of scallions and dried shitake mushrooms to add some variety. Nong Shim and Samyang are certainly battling it out to win the Korean hot and spicy noodle battle. Their products are so similar and redundant that I cannot really tell them apart. But they happen to be one of my favorite styles so I am not going to complain!